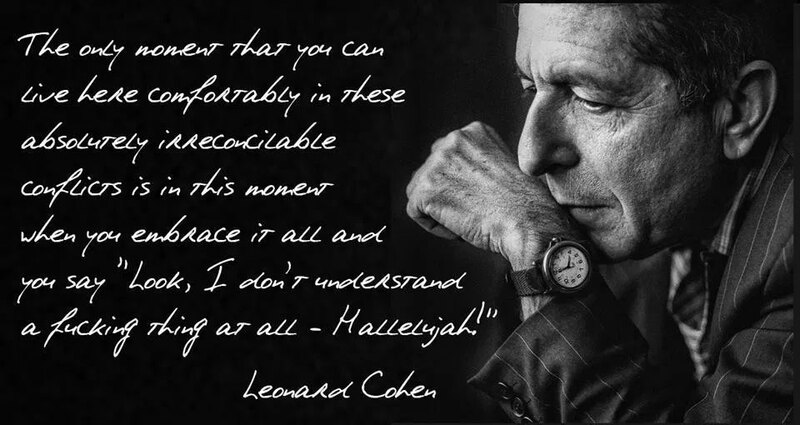 Central to Leonard Cohen’s work is the notion that not only is life imperfect but also “this realm does not admit to resolution.” His solution is to surrender the illusion that we can decipher, let alone solve the human predicament, so that, instead, we can “stand before the Lord of Song” to say “Hallelujah.” While more poetically expressed in his songs like “Hallelujah” and “Anthem,” my favorite of Leonard Cohen’s own explanations of this idea is taken from a 1988 interview: How The Heart Approaches What It Yearns by John McKenna. RTE: May 9 & 12, 1988. Photo by Antonio Olmos. I am republishing selected posts from Cohencentric (my former Leonard Cohen site) here on AllanShowalter.com (these posts can be found at Leonard Cohen). This entry was originally posted March 11, 2015 at Cohencentric.